A few days ago the Tomahawks made this first reported tender signing for the 2018-19 NAHL season. Ethan Webb, from the Esmark Stars U18 who play in the NAPHL. As a defensman for the Stars, he's appeared in 10 games this season so far and has 7 points (1 goal, 6 assists). 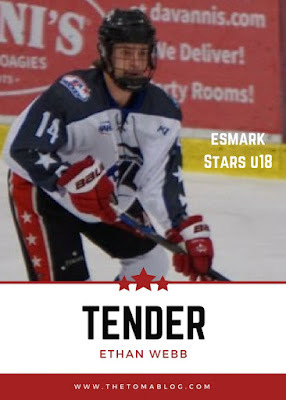 He is former teammates with current Tomahawks' first year player, Christian Gorscak, as they both played for the Esmark Stars U16 team in 2016-2017. Webb is a 2000 birth year player who currently stands at 5'10, 154lb. Here's his tweet about signing a tender with the Tomahawks back on November 15, 2017. We're now on Instagram for those of you who have an account. Come follow us and feel free to tag us in your Tomahawks' photos. We want to try something new and fun on our social media pages and we'll kick it off tomorrow. Meme Monday. 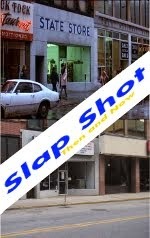 Share with us on Twitter, Facebook, Instagram, and the Message board your favorite hockey related memes. They can be ones you've seen around the internet or one's that you've made yourself. They can be about the Tomahawks, the NAHL, NHL, or just hockey in general. We'll share our favorite ones too. Since our readers come from all backgrounds and age ranges we do ask that the memes you share are SFW. No NSFW will be allowed. This will be a weekly feature happening every Monday. You can directly post a picture(s) on any of our accounts or send them to us via social media messages or by e-mail, thetomablog@gmail.com if you want us to post them for you. Since the Tomahawks don't play a game this week, we'll look back at this past weekend's split against the Wilke-Barre/Scranton Knights at some point during the week. If there's any breaking news about the Tomahawks we'll also make sure to report on it and fill everyone in. Hope everyone in Hawks Nation has a great Thanksgiving! The Johnstown Tomahawks did something this weekend they haven't been able to do all season long thus far; win a series, picking up three points out of four. Johnstown has now gotten at least one point from the Knights the last three times they've played against them. Next weekend the Tomahawks head to the road where they'll face the WB/Scranton Knights once again for a two-game set. After a terrible start to the season, Johnstown has begun to claw themselves back to a respectable record and hopefully a playoff spot. The Tomahawks are 3-5-1-1 in their last 10 games after starting the season 2-12-0. Currently the Hawks sit in last place in the East Division standings with 12 points. Ahead of them, New Jersey Titans with 22 points, Philadelphia Rebels with 26 points, Northeast Generals with 28 points, and WB/Scranton with 29 points. WB/Scranton currently is the best team in the league, though this weekend they didn't really look like it through this writer's eyes. Are the Knights not as good as their record indicates or are the Tomahawks starting to get their game together? I think it's a little of both. Just last season if this happened at the War Memorial this goal probably wouldn't have counted as the old scoreboard didn't keep track of the milliseconds on the clock. Luckily, the War Memorial's new scoreboard, does include milliseconds, which clearly showed that the Tomahawks scored the game-tying goal just with time left on the clock. While both teams exchanged chances in overtime, neither team could end things and it took a shootout to find a winner. The best-of-three round shootout took an addition four shooters (seven rounds total) before the Knights won the game on a goal from Gabe Temple. It would have been the perfect ending for Johnstown to find a way to win this game, but having a team desperate to pick up points, at least that's what the Hawks were able to do on Friday night. On Saturday, it was another tight-checking, defensive game, with both team's goalie's making big saves at key times. Britt League faced 28 shots and turned every single one of them away as he picked up his first shutout of the season, and first as a Tomahawk. This was also the Tomahawks first shutout of the year as a team. Britt League was also in net on Friday night where he faced 38 shots and made 36 saves. With such a great performance over the weekend, the NAHL named Leauge the East Division Player of the Week. Fellow Tomahawks' player, Christian Gorscak was named 2nd star. Something that really wasn't a factor this past weekend was the refereeing. All in all, I thought that the official did a good job. Anthony Opanowski, the ref who did both games this weekend, reminded me of an old school ECHL ref like, Joe Ernst. Mr. Opanowski let both teams play and hardly called anything. Now, you might not like that, and sure there were times when a guy got tripped, or hooked, or board (both ways) and it wasn't called when it could have been, but he was consistent and make those calls for either team. There wasn't that much rough stuff that happened between the two teams this weekend either. As fans, we're so use to seeing Philadelphia, New Jersey, Northeast games get, at points, out of control, but I can't really remember a game where that sort of thing happens against Wilkes-Barre/Scranton. The Knights head coach, Tom Kowal, is also one of the only coaches that I've seen come into Johnstown and not consistently scream at his players and the refs. There was some chirping in between the benches this weekend, but that kind of stuff always happens when you're playing such an emotional game like hockey. It definitely wasn't like the prior weekend vs the Titans. The yelling, trash-talking, and goating was never ending on both sides, most of which can't be repeating on a blog like this one without heavy censoring. I guess what I'm trying to say is that even though those in your face, hard hitting, fight filled, rivalry games are exciting to watch and be a part of, it's also nice to just watch two teams play hockey and rely on skill and hard work to win the game. Out of all the teams Johnstown plays, the Knights are probably the one team I don't hate. Philadelpha and the rest of the division, well, that could be another entire blog post of it's own. The team really is starting to play better and it's showing in the standings. The Tomahawks have a ton of work to still do and it's going to take 100% effort each and every night from now until the end of the season to work out of the hole they put themselves in at the start of the year, but it's doable. The Hawks have two games this weekend vs Wilkes-Barre/Scranton. They'll be off the following week for Thanksgiving Holiday. They'll then host the Titans for three more games, and then the Knights again for two. That's fourteen points up for grabs. The Tomahwks have a real good chance of putting themselves right there with the rest of the division come the middle of December. P.S. The Tomahawks had a very big crowd on Saturday night. It was reported as 3,038 fans. Overall, the NAHL lists Johnstown as 5th in league attendance averaging 2,116 fans at home. This is not exactly correct as they're factoring in the two home games at the showcase towards the attendance. If you take out those two games the Tomahawks are actually averaging 2,086 fans at 1st Summit Arena @ Cambria War Memorial. Another weekend of hockey is in the books and the Tomahawks found themselves only winning one of three games. If you just look at the stat sheet you might be thinking, "same old, same old," but for those at 1st Summit Arena @ Cambria County War Memorial they saw something different. They saw a team battling. Improving. One bounce (and a fair ref) away from having that 1-2 record turning the other way. The weekend didn't start off great as the Tomahawks dropped Friday's game by the score of 6-3. Out of the nine goals that were scored in the game, six of them were on special teams. One was an empty netter. The Tomahawks didn't look terrible and actually out-shot the Titans in the game, 39-34. It was just one of those games that things didn't go right for the Tomahawks, and a couple breakdowns cost them the game. On Saturday, the Tomahawks and Titans had a physical affair. In total, the teams would combine for a total of 121 penalty minutes. The turning point of the game came in the second period with the Tomahawks down a goal, 2-1. Chris Trouba carried the puck along the boards on the penalty box wall when he was checked from behind by Titans' forward, Oliver MacDonald. The hit, which the referee called correctly in this instance, lead to the Tomahawks having a five-minute power play. Before the players came out onto the ice to start the power play the Tomahawks bench was making sure that everyone wearing a white sweater knew that this was the moment they had to get back at the Titans, not with their fists (this time) but on the scoreboard. Players yelling to each other things like "this is our shot" and "time to make them pay, boys," were just a few things you could hear the players verbalizing from over the glass. It wasn't just all talk. The Tomahawks followed through and in the span of five minutes scored three goals to not only give them the lead, but eventually the win. First, it was Solensky to hammer a puck past goaltender Matt Ladd to tie the game at two. Then, little more than a minute later, Andy Nedejkovic would give the Tomahawks the lead. Less than a minutes later, Kile would bury a puck in the back of the net to put the Tomahawks up by two, a very important marker as New Jersey would pull within one early in the third period. After New Jersey's Spencer Stanley scored his first goal of the season bringing the score to 4-3 Johnstown, the Tomahawks found themselves having to kill several penalties throughout the remainder of the game. At one point the Tomahawks even had to deal with a 5-on-3 penalty kill. Having the leagues worst penalty kill, only killing 66% percent of their odd-man advantages, the Tomahawks did anything and everything they could to maintain the lead. Players like, Andrew Andary laid his body on the line blocking several shots from reaching the net. When a puck did manage to find it's way though the heavy traffic in front, Britt League was equal to the task. Overall, League faced 30 New Jersey shots, 15 of which came in the third period, but other than the early goal, League didn't crack and in standing tall picked up his first win of the season. This was Johnstown's fourth win overall this season and marked head coach Mike Letizia's 100th win behind the Tomahawks bench. On Sunday, the same two teams went to battle once again. It was a tight checking, low scoring affair. At times, tempers were starting to boil and usually it was New Jersey's Tate Singleton, scorer and agitator that was in the middle of the chipping. While both teams only had ten minutes of penalties each, it didn't mean that there wasn't penalty worthy things happening on the ice. But, as it seems to always be the case, the referees turned a blind eye to it, especially when it would have resulted in a Johnstown man advantage. 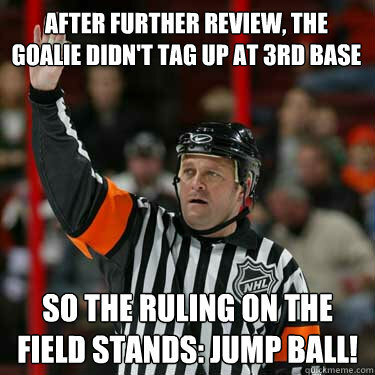 I'm not one to jump on a ref after every call that's made against the hometown team. In most cases, whether fans like it or not, when a penalty is called it's usually granted. Though there were a few calls this weekend that left not only myself scratching my head, but many of the fans in attendace. One example came on Saturday night after a New Jersey player was caught with a high stick. The Tomahawks player was whistled for the high-sticking minor and sent to the box for two minutes. Minutes after calling the penalty, but before the puck was dropped, the ref was refereed to the Titans bench to inspect the high-sticked player's neck. Seeing a scratch on the player, which was only pointed out to him after the player had gone to the bench and had the trainer start working on him, did the ref change his mind and turned his minor into a double minor. Another example came on Sunday when Jack Leavy made a save and then covered up the puck only to be ran into. Of course, when something like this happens, there's going to be some rough stuff that happens to that player. Somehow, instead of Johnstown getting a four minute power play, they only go two, when Johnstown was given a minor for roughing. Then, the turning point of Sunday's game. New Jersey's Gavin Gulash wrapped the puck around Johnstown's net and appeared to score as indicated by his celebrating. The light never went on because for whatever reason, there wasn't a goal judge at that net for this game. The ref, who by the time got to the net for a good view of the puck, the puck was already down the ice. Talking with his fellow linesmen and neither of them seeming to know what happened, the ref awarded the goal which put New Jersey up 2-1, which would become the final score. A team that's having a tough season as it is doesn't need it to be even that much tougher when the guys in charge of keeping things fair seem to "have it out" for the Hawks. You'd think, the team that leads the division in attendance by thousands, which can only help the league's bottom line (I mean there's NO way teams like Philadelphia, New Jersey, Northeast, WB/Scranton are making any money), and has a strong ownership group which includes Rick Bouchard listed as a 2017-18 NAHL Executive Committee member, get the right call, let's say - right every once in a while at least? But what is done is done and the Tomahawks will have to refocus as the Knights come into Johnstown this upcoming weekend for two games. The Knights are currently one point behind Northeast (who they swept last weekend) and overall are the second best team in the NAHL. The Tomahawks will have their hands full, but last time they played the Knights the Tomahawks were able to pick up a point in overtime. After starting the season 2-12-0 the Tomahawks are 2-4-1 in their last 7 games. Things do look to be on the upswing for the Hawks. Let's hope they can continue that trend this weekend. The Johnstown Tomahawks are back at home this weekend as they take on the New Jersey Titans. In fact, they'll be home for a lot of games in the next couple of months as their next 19 of 23 games will take place at 1st Summit Arena @ Cambria County War Memorial. The Tomahawks currently have the second worst record in the NAHL at 3-14-1 good for 7 points. The worst team, currently the Coulee Region Chill, have 6 points, but they've also played 7 fewer games. Though this is the worst start any Tomahawks' team has had in their six year history, they do hold a record of 1-2-1 in their last four games. With some roster moves made last week, the team is starting to play a bit better. This is a perfect time to start playing home games. So, as you can see there are a lot of new faces in the lineup to get use to, as well as two last names to learn how to pronounce (Nedeljkovic and Sengvongxay). While everyone can agree that this season hasn't started the way Johnstown wanted things to go, it's not time to throw in the towel either. New Jersey currently holds a record of 7-4-1-1 with 16 points. That's good for fourth place, the last playoff spot in the division. This weekends three-game-set, has six points up for grabs. If Johnstown can find a way to win all three games, they'd only be three points behind New Jersey. Is this doable? Why not? Johnstown ended their 12-game winless streak on Sunday night when they beat Philadelphia 3-1. The weekend before, they played two close games with WB/Scranton and took one of the games to overtime, earning them a point in the OT loss. New Jersey is riding a two game losing streak coming into the weekend as they dropped both games last weekend to the Northeast Generals (one was an overtime loss). Even if Johnstown can win two-out-of-three you can call the weekend a success. With most of the remaining games of the season all taking place vs other East Division teams, beating teams like New Jersey that sits just ahead of Johnstown in the standings is very important. One face you won't be seeing in a Titan jersey is former Johnstown Tomahawks' forward, Tiernan Seningen. He was released by the team on October 20, 2017. In six games with the Titans this year he had one goal. Extra: Here is a video from the Philadelphia Rebels showing their highlights on Monday night's game where forward Aaron Maguyon scored four of the Rebels six goals. I haven't posted it so we can see those goal, but instead to show you the "lighting" or lack thereof in the new arena they're playing in this year. Is it brighter there in person or is it really this dark on the ice?